Rockland County Orders Public Spaces Ban For Those Diagnosed With Measles It's the latest measure officials in the region have taken to combat the disease. Between Rockland County and New York City, more than 500 cases have been confirmed since the start of the year. A nurse prepares the measles, mumps and rubella vaccine at the Rockland County Health Department in Haverstraw, N.Y., earlier this month. As the number of confirmed measles cases in New York continues to tick up, one county is determined to stem the spread of the disease by keeping it out of public spaces. Rockland County, just north of New York City, issued an order Tuesday barring anyone diagnosed with measles from all places of public assembly, including schools, restaurants and places of worship. 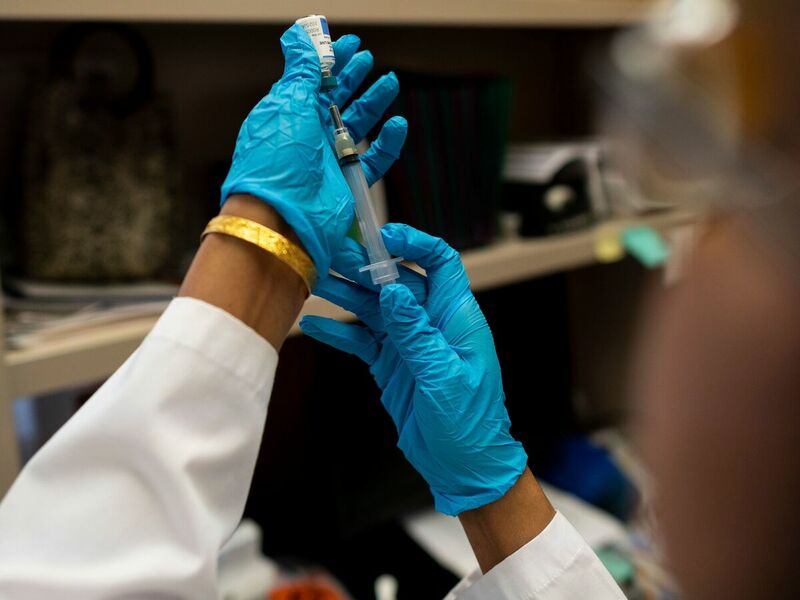 The order also applies to people who have been exposed to a person diagnosed with measles, based on laboratory evidence or an investigation by the county health department. Earlier this month, a judge blocked the county's emergency declaration keeping unvaccinated children from public places. "To be told that we should wait for someone to die because of this disease is absolutely beyond belief," said Rockland County Executive Ed Day at a press conference Monday. "Should we wait for hundreds more people to also fall ill?" It's the latest measure that officials in the region have taken to combat the spread of measles. As of Monday, 186 cases had been confirmed in Rockland County and 329 in New York City since the beginning of the year. The outbreaks, which are centered in ultra-Orthodox Jewish communities, have been associated with travelers returning from Israel, according to the Centers for Disease Control and Prevention. Cases have also been recorded across the country, including in Washington state, New Jersey, California and Michigan, bringing the total number to over 550. It's the second-largest outbreak in the U.S. in two decades. On Monday, New York City closed a preschool program at a yeshiva in Brooklyn for failing to comply with measles vaccination requirements. The closing, which is the first for this outbreak, came less than a week after Mayor Bill De Blasio issued an emergency declaration that mandates measles vaccines for all children in four Brooklyn ZIP codes. A group of parents has sued the city's Department of Health and Mental Hygiene over the mandated vaccinations, claiming that the current outbreaks are "insufficient to justify these drastic emergency measures" and "override the rights of individuals." The city's board will vote on Wednesday whether to extend the emergency declaration, The Associated Press reports. In Rockland, the county had previously announced a state of emergency that barred unvaccinated children from all indoor public spaces. But a group of parents sued, claiming the March 26 order "achieves no valid public purpose" and deprives children of their right to an education. A state judge later blocked enforcement of the ban, finding that the small number of measles cases wasn't enough for the county to declare a state of emergency. Day argued on Tuesday that the outbreak should have been considered enough cause to warrant an emergency declaration. "Despite our best efforts, this outbreak is not going away," he said. "If anything, it is now accelerating, much as we feared. We have seen 33 new cases since we declared our now-nullified state of emergency three weeks ago. In short, we saw this coming." The new order takes effect while the state of emergency undergoes appeal, according to the county — and just days before the start of Passover, when many Jewish people will travel to visit family and gather in synagogues. Officials say about 28 percent of kids in the county are not vaccinated, as NPR has reported. Experts recommend a much higher vaccination rate — over 90 percent — to achieve what's known as "herd immunity" and keep the disease from spreading.